“We are the most tailored fitness club in town!” said Carl Clover of The Workout Company in Normal. Owners Carl and Carol Clover opened the club in 1998. The Workout Co. is a Bloomington Normal original fitness center often called “the neighborhood gym.” It is unique in that Carl and Carol are the only full-time employees. “We have 61 part-time employees, which includes many trainers and instructors,” said Carl. The facility at 419 Kays Drive has 20,000 sq. ft. “We have 52 Les Mills classes a week,” said Mandy Swartzendruber, the General Manager. Mandy joined the club about 8 months ago. A new satellite location with 4,000 sq. ft. opened on GE Road in 2016 where large team training, small group private training and private training take place daily. “We are very community oriented and often employ students involved with Illinois State University’s Exercise Science and Nutrition Departments,” continued Mandy. “We operate on a seasonal kind of schedule, meaning ISU interns and staff work more heavily in the fall & winter.” The club does not have much turnover in instructors or trainers but is always making additions to classes and instructors. 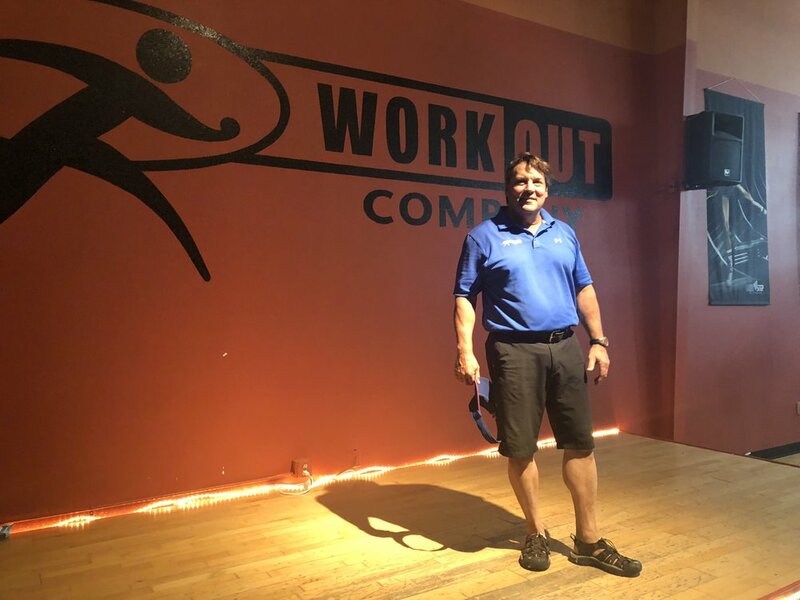 Previous to opening The Workout Co., Carl, who has a degree in exercise physiology, worked at the Multiplex Athletic Club in Deerfield. The club is very well known as it previously served as the training center for the Chicago Bulls. “Our busiest time of day is 5:30 to 7:30 am and 4:30 to 6:30 pm,” said Carl. The Workout Co. has over 1,300 members. “Our attrition rate is very low. Once someone joins they rarely leave,” said Mandy. The Workout Co. has partnerships with many companies, including Upper Limits climbing gym, where club members receive a discount. The club also has a blender bar that serves creative shakes like the Cookie Monster, No Bake Cookie, and Thin Mint. The club offers Les Mills classes, which are choreographed exercise-to-music group fitness classes. Some of the names include BodyStep, BodyFlow, and BodyPump. “Our trainers are first class and offer private training, small group private training and large group team training both as membership options and drop-in options so that everyone can try working out with a trainer no matter their budget,” said Mandy.